When something bad or unexpected happens at an organization, leaders rush to calm customers. They send out strategic emails, work closely with PR and legal teams, and do all they can to mitigate the crisis. But are company leaders doing enough to communicate with employees? Whether something goes awry within your company (for example, your CEO resigns) or outwardly with your customers (for example, a security breach), communicating with employees should be a top priority. After all, when you have a crisis on your hands, you need your employees in your corner lending support. You need to address the fears of your team members, assure them you will move forward together, and give them the tools they need to communicate with their families, customers, and each other. Today, we’re sharing how you can build a company communication crisis plan so you can communicate with employees when things go wrong. No matter the size of your company, a crisis can strike unexpectedly. After it happens, it can be difficult to come up with a game plan. That’s why many organizations have a formal crisis communication plan. 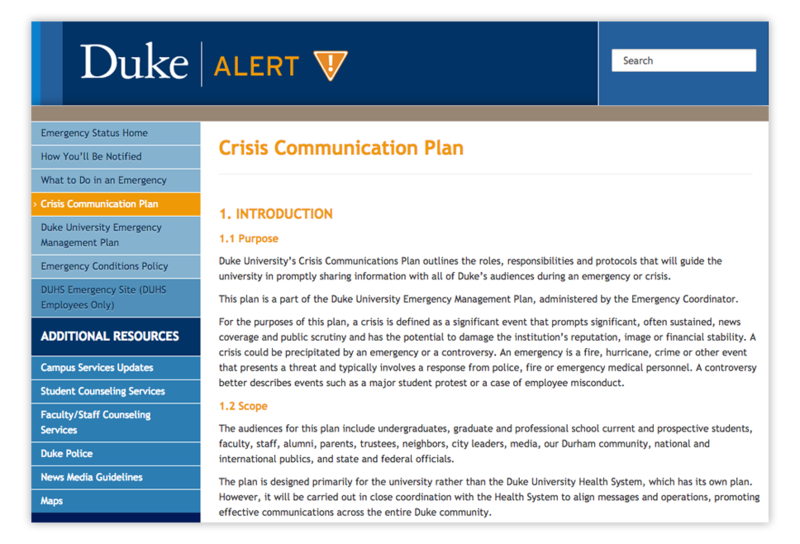 For example, Duke University shares its crisis communication plan on its website, detailing what happens if there is ever a crisis at the school. This document outlines procedures, who will be in charge, and where the crisis committee will meet. Should an emergency ever occur, the team at Duke will be ready to execute on the plan. Although you want to handle a crisis as quickly as possible, you also need to make sure you understand the biggest concerns your team is having. Are they worried about getting laid off, moving teams, or are they simply trying to gather a better picture of the company’s health? Is this going to affect my job? Might I get laid off? How are customers reacting to this? What should I tell my family? How should I discuss this with my direct reports? Are there immediate changes I should know about? If I have more questions, who can I ask? Each crisis is different, and no matter what plan you have outlined, you need to make sure you’re accounting for the nuances of the particular instance. For example, the plan for an internal crisis might look a lot different from one that affects customers or stockholders. When it comes to sending out company communications, make sure you’re addressing the specifics of the crisis, rather than sending out a generic, vague email created in advance. The more specific you can be, the calmer your employees will feel. It’s also important to make sure your messages are targeted to the right subset of people. Managers should receive different info from their reports, for example. For example, you can provide example scripts for employees to use with customers. No matter what, make sure you give employees the tools they need to talk about the crisis wherever they go. Although the uncertainty of a crisis can make it difficult to talk about, it’s important that your employees feel that they can give feedback and ask questions. They need to feel as though they can discuss their concerns with their managers. To accomplish this, you can encourage managers to go to their employees, hold open forums with company leaders, and send out surveys to collect feedback on employee sentiment. In general, communicating should be a top priority at your organization, no matter how many employees you have. When everyone is on the same page, it makes it easier to get through a crisis.